We specialize in inspections and certifications of aboveground storage tanks and pipelines, through the use of advanced nondestructive testing equipment manufactured by leading brands, operated by experienced and certified technicians specializing in the interpretation of technical data for purposes of proactive reporting and preventative maintenance to ensure the integrity and longevity of your assets. Historically the only method for determining the volume of sludge in a tank has involved manually dipping with a weighted line. The dip method is restricted to the number and position of access points on the tank roof that go through into the oil, e.g. roof legs, vents, man-ways, etc. For tanks with only an inner circle of roof legs near the centre and another outer ring of legs near the tank shell it is impossible to determine the volume of sludge over most of the tank floor. With the most field experience on the African continent in EODR (electro-optical distance-ranging), we provide accurate and detailed measurement and calibration of large petroleum and chemical cargo storage tanks, including shore tank as well as underground storage tanks. Using the latest EODR and 3D technology for tank calibration, our engineers and technicians are equipped with state-of-the-art measuring devices to measure and calibrate tanks of various shapes, sizes and designs. Measurements include detailed assessments of shell wall verticality, roundness, differential, out-of-plane, floor bottom and edge settlement including that of shell peaking & banding. API 653 defines the American Petroleum Institute’s standards for the inspection, maintenance, repair and alteration of aboveground field-erected steel storage tanks at atmospheric pressure, including riveted and welded tanks, with diameters greater than 30 feet (10 metres) or over 50 feet (16+ metres) tall. API 653 mandates routine monthly inspections, comprehensive in-service and out-of-service inspections, with relevant certification provided by a licensed inspector. API 653 certifications provide for assessment of the physical condition of a tank, evaluation of suitability for its continued service, as well as implementation of preventative maintenance programs assuring its integrity and longevity. Our end-to-end services include routine in-service and out-of-service nondestructive inspections, calibrations, audit and proactive reporting. 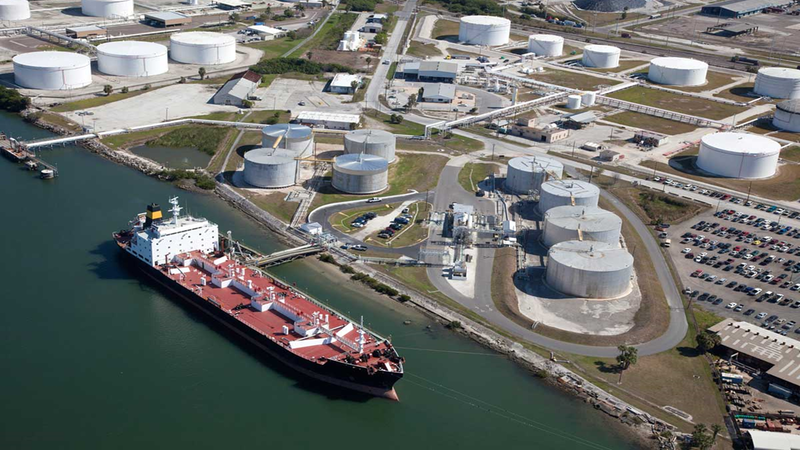 Our dual focus is on preventative maintenance and to minimize downtime, ensuring that your storage tanks meet all relevant regulations and that your assets maintain their longevity. Petro-Base Group Namibia. © 2019 All Rights Reserved.